The Wildcats are poised to contend for the Legends Division title in 2013. 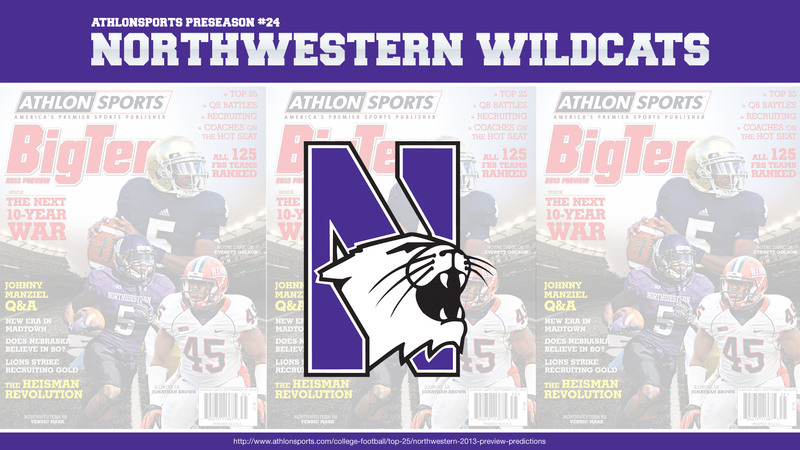 After transitioning to a run-based attack in 2012, Northwestern could feature one of the Big Ten’s best offenses if its line comes together. The Wildcats return almost all of their top skill players, including senior running back Venric Mark, an All-Big Ten selection who racked up 1,366 rushing yards in 2012. Mark and quarterback Kain Colter spark a zone-read run game that at times is unstoppable, particularly in the red zone. The Wildcats will continue using a two-quarterback system of Colter and junior Trevor Siemian that proved effective for much of 2012. Although Colter is a true dual-threat while Siemian boasts a big-time arm, both must show greater consistency with the high-percentage passes that fuel the spread offense. Northwestern once again looks extremely deep at receiver and tight end but needs more production from a group that had no player eclipse 35 receptions last fall. The offense will hinge on a line that must replace three starters and had several key players out in spring practice. Center Brandon Vitabile is an excellent cornerstone, but Northwestern needs to fill out the other four spots and maintain the physical mentality that emerged in 2012. The defense took a step forward last season and could take another as a new emphasis on speed in recruiting is paying off. Northwestern features playmakers at all three levels and saw its takeaways (29) and sacks (28) soar in 2012. Senior end Tyler Scott anchors the defensive line after leading the team in sacks (nine), tackles for a loss (12.5) and forced fumbles (three) in 2012. He’ll provide the power, while Dean Lowry, Deonte Gibson and Ifeadi Odenigbo bring tremendous speed as edge-rushers. The Wildcats are thin at defensive tackle and need young players to emerge. Northwestern returns two starters at linebacker in veteran Damien Proby in the middle and Chi Chi Ariguzo, who had a role in six turnovers last season and brings a ball-hawking mentality to either outside spot. Collin Ellis and Drew Smith both will see field time. No unit has benefited from the speed-based recruiting efforts more than the secondary, which finally boasts enough Big Ten-caliber players. Productive safety Ibraheim Campbell enters his third season as a starter, and dynamic cornerback Nick VanHoose also returns. Coach Pat Fitzgerald is excited about the depth at cornerback. Hard-hitting sophomore Traveon Henry could fill the starting safety spot opposite Campbell. Venric Mark, RB - Became Northwestern’s first 1,000-yard rusher since 2006 and earned All-America honors as a punt returner. Kain Colter, QB - Racked up 1,935 yards of total offense (894 rush, 872 pass, 169 receiving) and 20 touchdowns last season. Tyler Scott, DE - Had breakout junior season, leading the Wildcats in sacks (nine), tackles for a loss (12.5) and forced fumbles (three). A liability for years, Northwestern’s kicking game is suddenly a strength. The Wildcats return the Big Ten’s top kicker in Jeff Budzien, who made 19-of-20 field-goal attempts in 2012, and the league’s top return threat in Mark, who earned All-America honors as a punt returner after recording two touchdowns and averaging 18.7 yards per runback. Veteran punter Brandon Williams enters his fourth year as the starter. Northwestern finally put its bowl bugaboo in the rear-view mirror, and with most of its core pieces back from a 10-win team, the next step is to compete for a Big Ten championship. Although Fitzgerald has elevated the program in seven years, he’s still looking for his first league title as a coach. The offense should be explosive if the line comes together in the preseason, as Mark provides the run threat Northwestern lacked for years. The defense boasts more speed, athleticism and playmakers like Scott, Ariguzo, VanHoose and Campbell. Special teams once again should be very strong.